Fr. 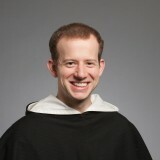 Raymund Snyder, O.P., is the Promoter for Student Leadership for the Thomistic Institute in Washington, DC. Originally from Kansas, he studied philosophy and classics at the University of Notre Dame and entered the Order of Preachers in 2010. He holds an STB/M.Div. from the Dominican House of Studies and a licentiate in philosophy from the Catholic University of America. His academic interests include metaphysics, natural Theology, and Neoplatonism. Recently Fr. Raymund has recently organized “Credo,” a comprehensive RCIA media program with St. Benedict Press. More from Fr. Raymund Snyder, O.P.